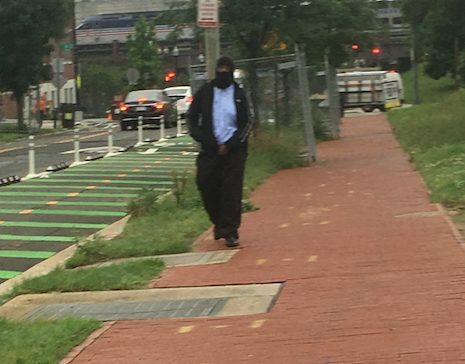 Pretty sure I ran into the NOMA flasher this morning at 2nd and M NE at about 7:25am. Was heading to the Metro with my son in his stroller, when a husky black man (maybe in his 30’s, ~5′-10, mustache, wearing brown khakis, pink zip up hoodie, and a black drawstring backpack) suddenly pulled a stocking cap down over his face. I thought he was just adjusting the cap until I realized it was more of a balaclava with a big cut out for his eyes. I stopped right in the middle of the sidewalk, not sure whether to take a picture of him, or just shout at him to keep it in his pants. But before I could do anything he glanced at me and my son and quickly rolled his mask back up and walked on by. I turned to watch him go and saw that there were two women walking behind me. I waited until he passed by them, which he did without doing anything.